‘Tis the season to see pretty plaid patterns as Christmas decorations, which are reminiscent of Scottish tartans. For many years, the English banned the Scots from wearing their cultural clothing (learn more about the “repeal of dress” here). Also, for four centuries, Christmas was banned in Scotland because Protestant rulers of the 16th century associated Christ’s mass with Catholicism. It was only in 1958 that Christmas became an official holiday in Scotland. Now with the freedom to express themselves with plaid AND observe Christmas Day, the Scots have been very influential in their holiday celebrations with decorations and traditions. 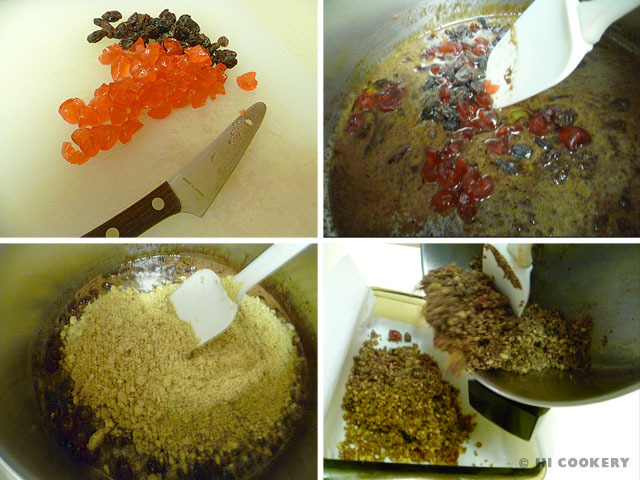 As a Christmas dessert, we made a traditional Scottish treat called tiffin. The recipe originated in Troon, Scotland, in the 1900s, and is a chocolate cake-like confectionary commonly comprising of crushed digestive or rich tea biscuits (cookies), cocoa powder, golden syrup and dried fruit with a top layer of melted chocolate. 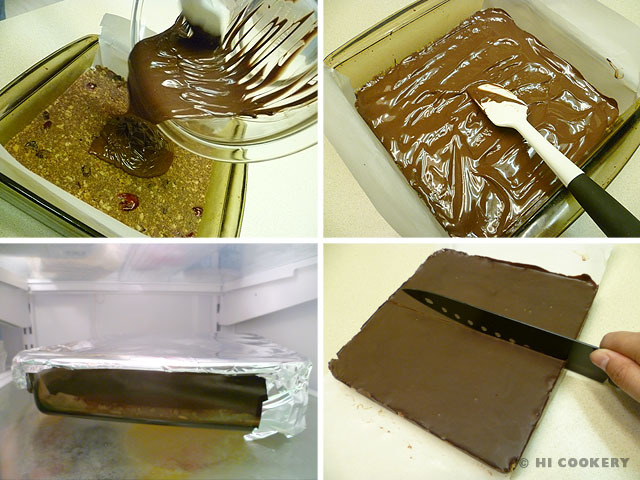 Although it is considered a “cake”, tiffin does not require baking in the oven. Because the mixture is chilled in the refrigerator to set until hardened, tiffin is also known as fridge or icebox cake, chocolate concrete cake and no- bake chocolate biscuit cake. Tiffin is very similar to the groom’s cake made for Prince William when he married Kate Middleton in 2011 (but the royal recipe contains eggs). Like the royal cake, tiffin is a treat that tastes rich and decadent but is very easy to make, especially for Christmas cookie exchanges and for Hogmanay next week. 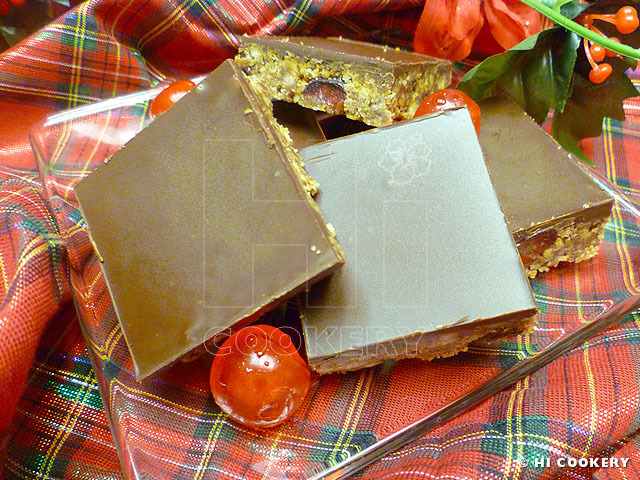 Try tiffin and celebrate Christmas and be proud of plaid. Nollaig Chridheil (Merry Christmas in Scots Gaelic)! In a plastic bag, crush the biscuits into small crumbs. Set aside. 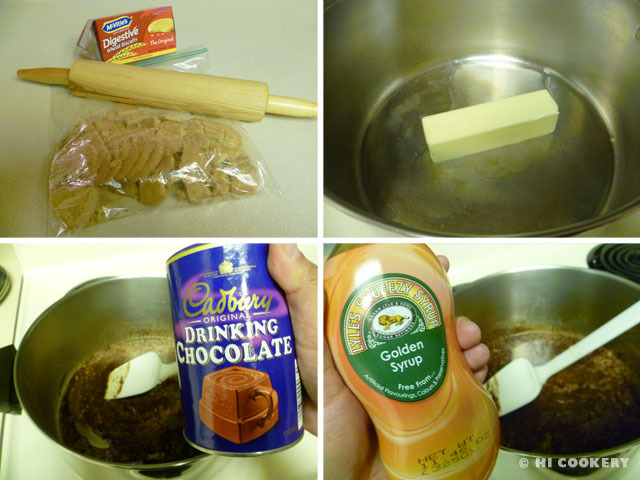 In a saucepan over medium low heat, melt the butter with the cocoa powder and golden syrup and stir until smooth. Add the raisins and glacé cherries. Add the crushed biscuit pieces and mix to coat well. Line an 8×8-inch square pan with parchment or wax paper with a little overhang for the handles. Press the chocolate mixture into the pan until flat and even. Set aside. Pour melted chocolate over the top and smooth with a spatula. Refrigerate for at least an hour until firm. Lift the tiffin out of the pan using the paper handles. Slice into 36 squares. Because Christmas was banned for 400 years in Scotland, the Scots have celebrated Hogmanay (new year) in grander style. “Auld Lang Syne” is a popular and traditional Scottish song for the new year. Search our blog for other Scottish and Christmas recipes.